I’m curious if any readers have some advice for me and a friend of mine. She and her husband have a young German Shorthaired Pointer they’d love to train to hunt, but are having problems finding any professional trainers who don’t use ear pinches, forced retrieves and a basic attitude of “Do it because I say so!” This is not the first time I’ve been asked about positive trainers in this field, whether for retrievers or pointers, and I haven’t had a lot of luck finding professionals who take dogs in and train them using primarily positive methods. If you know the world of hunting dogs, you know that there is a long history of “positive punishment” and dominance-based training in the field, perhaps more so than any other, at least in my experience. Meanwhile, back at the farm, the “to do” list for Africa never seems to get smaller. As soon as I cross one thing off, I write two more on. Besides power packing (every ounce is considered at great length, every piece of clothing requires careful thought! ), the list of things to do for the farm and the animals never seems to end. But we’re making progress, and I’ve had another training session with the wonderful woman who is farm sitting (who is a Certified Equine Massage Therapist and massages Lassie into heaven; I’m not sure Lassie will be happy when I return! ), all the food and supplements for 3 weeks are collected and slowly but surely we’re getting closer to departure. Ewe Martha 2.0 is still having respiratory trouble, along with 2 others, diagnosis is now down to 2 things (lung worms in spite of being wormed w/ 2 different wormers or OPP, an untreatable and ultimately fatal wasting disease)… I will leave with some new medicine and all paws crossed for the old girl. Here’s a photo of my friend’s GSP. Gotta love the tongue. Sorry, but I cannot offer any suggestions about positively reinforcement training for field work, but I am sure it can be done. Kathy Sadao, at a clicker seminar last year mentioned a trainer teaching field work using only click and treat. Although I went back through my notes I was not able to locate the name of the trainer. Have a wonderful time in Africa, my colleague and one of my dearest friends will be joining you, Meg Boscov. We are two of your biggest fans and I am thrilled that she is able to join you on your expedition. She left yesterday to spend a couple of days in London before meeting up with you and the others. I will keep my fingers and toes crossed for your Ewe. I can’t tell you much about it, the basenjis prefer to hunt without human interference. But it is clickerly. There’s a yahoo group, I believe, that deals with clicker or at least positive gundog training. I do! Steve Rafe of Rapport Training (I think he’s in Wisconsin) teaches positive reinforcement and how to use your body language to encourage better retrieving and so on. Another trainer who used to train dolphins, I believe for Sea World, is Chris Goegan who is in North East Ohio. I worked with Steve Reynolds who travels the United States with GSP’s & Weimaraners and he is willing to use positive reinforcement if you request that’s how your dog should be trained. I clicker trained my Weimaraner to a Master Hunter and part of a Field Championship. I taught him to “look” or “mark” another dog on point, then to “whoa” using a clicker. He also earned his Retrieving Dog Excellent title using Sue Sternberg’s Inducive Retrieve methods. That would be the dog you used for a Feisty Fido seminar many moons ago in Ohio. Oh, and books, I think Susan Bulanda wrote a positive book on field training, but I’m not sure. Steve Rafe has several positive reinforcement booklets. Jim Barry just moved out of Rhode Island to the south somewhere, I do not have his forwarding contact info; BUT If you post the request for a positive gun dog trainer onto the CPDT or the APDT list, he may respond with a contact in your area. Kay Laurence has one on her website, I have this book and I recommend it. I have no personal experience training hunting dogs myself, but have had some casual exposure. The majority of people I have seen unfortunately do use e-collars for field training. However, I have also seen several people rely only on whistles, bird launchers, and praise/play for reward. Met one young fellow who used a clicker, said he read a book by Jim Barry, I think (co-authored by others he couldn’t remember). As far as packing goes, I love to backpack and say more power to you- count those ounces… they do add up quickly and your consideration pays off in the end. Sorry that your sheep are still not 100 percent, hope all is well soon. I am venturing into the world of positive hunt training with my 8mo toller. “Clicker Gundogs” by Helen Philips although I haven’t read the 2nd one I’m told it’ s from a british perspective. Other than that positive hunt trainers are basically on their own. Most people read the traditional books for the drills and then just modify them slightly to avoid the ear pinches/e-collars/etc. Jim Barry – Positive Gun Dogs. The woman I train with has worked with him on ocassion (she has FCRs). He is on the east coast but there is his book and your friend could try e-mailing him. here is a link to his web site. he used to be in RI but recently moved down to VA. I don’t know of any trainers, but I have trained 3 versatile (pointing) dogs with positive reinforcement, and have tested my dogs in NAVHDA and VDD. My first and oldest dog is a NAVHDA Prize I Utility dog, and she is considered a “finished dog” – all with positive reinforcement (full disclosure – I pinched her ear for 3 days because a trainer told me I had to force fetch her and in the end realized what a ridiculous thing it was!). I didn’t force fetch any of my dogs. I have the book Positive Gundog, but honestly haven’t read it. Mostly because it didn’t tell me anything I wasn’t already doing. The AHDC (American Hunting Dog Club) has a book that does a good job of outlining steadiness training that I modified to be more positive reinforcement. There’s also a book that’s been recommended to me many times called “How to Help Gun Dogs train themselves” by Joan Bailey. The hunting dog world seems to be the last group to view positive reinforcement methods as a reliable way to train dogs. I have a lot of “agree to disagree” conversations with folks, mostly because my dogs are proof that it can be done without negative reinforcement. I have lots of ideas about how to start “the program”. I’m so glad to hear that there are others out there who see the light! A very good friend of mine (not a professional trainer, just a personal trainer and competitor) trains her American Cockers to hunt without ear pinches or electronic collars. She starts them from when they can walk (or when they come home), and her methods are very positive. She does use NRMs and some correction when she feels the dog is blowing her off, but otherwise she is all about motivation. She has top-level hunting and obedience Cockers, and has the only American and Canadian Master Hunter American Cocker. She’s my idol as far as training goes. Great links everyone — I got into a very heated argument with our builder a few months ago about this very subject and will be forwarding all the information to him. He was the first to admit that his hunting dogs were not very well mannered at home — would jump on visitors, bark, get on the furniture, steal food etc — but in the field he and his buddies use string them up approach and the owner’s spit is the only infrequent reward. Meanwhile, I had just finished a slew of positive reinforcement books in getting ready for our new puppy and I argued my point of few for about an hour but I don’t know that I made a dent… I think there is a perspective that it is a female / soft approach vs. the old school guy hunter method. Mis-informed, but nonetheless it is out there. So sorry I couldn’t swing the trip to Kenya… but I wouldn’t miss my pup’s early months either. He learns something new every day! Hi Trish! One book is Positive Gun Dogs by Jim Barry, Mary Emmen and Sue Smith. There’s info on the Web site: http://www.positivegundogs.com/. Sue is in Austin, TX, her business is Raising Canine and Web site is http://www.raisingcanine.com. Sue networks with a lot of trainers, so she may know of someone close to your friend. I recently watched a video called Retriever Training the Wildrose Way by Mike Stewart that impressed me. I do not hunt with dogs nor ever plan to so my experience is limited. I watched it because a friend is getting one of his pups and wanted my opinion. I can’t say I agreed with everything 100% (there are some collar corrections used in the basic obed portion but they were mild and fair and he explained amount of force well) but overall I liked the way the info was presented and the way he teaches the hunting stuff by repetition. I think he called it memory training. Good luck with your ewe. I hope she feels better soon. It gives me useful information that I’ve been searching for. I was amazed with the information in your article, it’s awesome!! MESARD (Maine Search and Rescue Dogs) uses primarily positive training methods for tracking and scent work. Maybe a similar group in the area would be a good place to start. I know it is not exactly the same thing but I would think there would be some overlap. I forgot to add that I live in the Milwaukee area. All of the trainers with whom I am familir do not use positive reinforcement for hunting dog training. They still rely on the whoa post, force fetch, and e-collars to do the job. From my experience, it’s fairly easy to train retrieving with positive reinforcement. What took me more time was training steadiness – getting the dogs to hold their point until the bird was shot and fell to the ground. Part of the reason is that I was new to the hunting dog world in general and while I was “seasoned” in positive reinforcement training, it took me time to adapt those methods to hunting scenarios. That being said, it can be done. I also recommend “Positive Gun Dogs” by Jim Barry. I will say that if you have not done extensive training before (especially for hunt trial stuff), the book may be a bit overwhelming because it puts a lot of emphasis on keeping logs to document rates of reinforcement, and not as much “down to earth” explanation about increasing criteria. The book kind of assumes some level of previous gun dog experience, but not much positive-training experience. Sad but funny story…we had a client come to our basic obedience class with his English Setter puppy planning to start gun dog training once the basics had been mastered. Our trainer begged him to use a postive field trainer, especially since this puppy was extremely soft. She told him he might never be able to recover from even a single negative experience. Given this guy was macho and he had done this with all his gun dogs in the past, he went against her advice and used a traditional shock collar trainer. His dog was so traumatized by the first field session that all it would do is huddle in the base of the truck and urinate and vomit on itself. He came back to our trainer and asked her to fix the problem he created. She said she would try, but only if he was 100% compliant with her instructions. He agreed. For the next three months, while this macho guy’s hunting buddies were in the field working their dogs, our macho client sat in the back of his truck with his dog on his dog’s favorite baby blanket, talking baby talk, playing with a bunch of his dogs favorite stuffed animals and feeding his dog pieces of seasoned meat. I wish I could have been there to take a picture. The dog never became a hunting dog, but it eventually did learn to enjoy going along for the ride. Packing for Africa is tough, knowing how many times those bags will be hoisted before returning. It’s always bittersweet to travel, leaving the dogs at home (although they will be spoiled!). Your name came up last Saturday! We took our three to SF for a photo shoot with Amanda Jones. What fun! She told about going to your farm and how much she enjoyed it (after I said I had just been to your seminar). I can hardly wait to see the photos–the glimpses on her laptop looked so good. On a side, but related note…I moved from Wisconsin to Nevada and suffered the shock of a training culture about 10 years behind the rest of the country. (We are just now truly accepting positive reinforcement for training other than puppies.) The odd thing was that the Henderson, NV K-9 unit has several Schutzhund dogs that were trained completely with positive reinforcement. Is that not ironic! I have heard of Jim Barry’s book, but have not read it. I also know of Steve Rafe, but he is no longer in the midwest…Baltimore I think? One more book to check out is “Motivational Training for the Field” by Lorie C. Jolly. She is a mostly positive trainer, and has written a book with quite a few drills for training retrievers using positive methods. She also covers extensively how she teaches a retrieve using motivation and no ear pinch. This was discussed on the Yahoo Positive Gundog Training list. A great book about building a positive working relationship with pointers & setters in particular is “Bond of Passion” by Web Carnahan. Wow. I thought you all would have some good ideas, but this is fantastic. What a resource you all are, thank you so much. Although I don’t do any hunting training of any kind, I love comparing fields and getting new perspectives, so I’m just going to have to get some of these books when I get back. Taking a break from chores: Lassie’s nails trimmed, dogs brushed out, water tanks scrubbed, frig cleaned out, organic veggies picked up and stored, weeds pulled around bergament, poison ivy battled. Time to go immerse myself in African animal behavior. Oh boy. I’m not a pointing dog expert by any means, but I’ll give what I know on retrievers. The behaviors needed in retriever tests and trials in this country requires the use “pressure” to train for them. I don’t like this at all– which is why I don’t trial or test. My current dog is a pet-line golden that doesn’t like to retrieve, and I’m not going to force her. In US retriever trials, there are “blinds,” and to teach a dog to do well on a blind that is over a 100 yards away, you almost have to do “force fetching” with the dogs to make them good at it. This is further complicated with the fact that many US retrievers, even from working lines, don’t have the best retrieving instincts. Force-fetching actually covers up this weakness in retrieving instinct, and you wind up breeding dogs with inferior instinct. As strange it sounds to some trainers, there are retrievers that naturally retrieve to hand. That they’ve never seen one is more about their training methods and selection process than about the dogs themselves. Also, the dogs are required to run out and back in straight lines, even through water. This is very hard to train without the use of an e-collar. Force training is the culture of training retrievers, which is one reason why Labradors dominate the trials. Labradors are easily trained but are tough enough to put up with the pressure needed to turn them into retrievers using these methods. Most performance bred goldens are from stock that were never trained using these methods. They are descendants of wavy-coated/flat-coated retrievers that were used in battue shoots, where the dogs were required to find game using their noses more and the methods used for “breaking” them were generally milder. A good golden is a very easy dog to train, that is if you find a good golden. Now, the British trial and test system is more about the dog’s instincts than the trainer’s ability to punch out a good lining retriever. Positive methods are more common in their retriever culture, and you do see other breeds besides Labradors making it to the top levels of competition. And their dogs tend to be a little easier to handle, because they aren’t being selected for their ability to retrieve like wild while still re receiving e-collar corrections. The British trial dogs have to be more tractable, because they aren’t required to line. They have to be natural retrievers, because no one is forcing them to do so. So if we want more positive methods for retrievers, we may have to adjust our trial and test system, as well as the selective breeding programs. BTW, border collies can be used as working retrievers, and many are pretty good at it! Maybe the idea of training an animal positively, as a partner instead of a servant, to aid in the tracking, flushing, coursing, killing and eventually retrieving of another animal seems incongruous. I don’t have a problem with using what you kill for food; I don’t even have a problem with the use of dogs to aid in this activity, it is in their nature to use their superior sense of smell and hearing to be superior hunters/scavengers and in our nature to use a strength to gain an advantage, but the idea of killing for sport and trophy is a bit aversive to me. I think that the mindset that leads to the lack of respect for the lives of the wild animals which are hunted for “sport” may lead to the preponderance of hunters that feel that they need to dominate their dogs or treat them with a similar disdain. They don’t respect the animals intelligence or ability to perform tasks effectively. We, the human animal, have in many situations upset the balance of ecosystems such that we have thrown things out of balance which leads to overpoulation in prey animals, so the arguement of humane population control seems disingenuous to me. We decimated the wolf populations so we are overrun with deer; now we have to hunt and kill the deer so that they don’t starve to death in the winter… It seems that we need to live more in harmony with nature, including positively training our domestic animals for whatever purpose that is, than we masters of the universe have in the past. And to retrieverman, why is it necessary to do 100 yard blind retreives? If it is too hard for a dog to do without the use of an e-collar or a forced retreive, then may the problem isn’t with the dog, its with the rules that the humans have put in place. Oh my. I run positively trained dogs that retrieve gorgeously. My dog has never been my servant while out hunting. Hunting is something I do to put food on the table, but mostly for the pure unadulterated joy I get to see in my dogs. There is no experience quite like watching a dog DO what it was bred and developed for. My Weim points with every fiber of his being and his joy at my gift of a pheasant from the sky is amazing. I’ve learned to have incredible respect for wildlife who outsmart me and I’ve learned so much about their beauty and their lives while enjoying time outdoors with my dogs. 100 yard blind retrieves are about the cooperation and trust and teamwork between handler and dog. A 100 yard blind retrieve is to ensure that game doesn’t get wasted and left to rot in a swamp. These retrieves can be necessary because the dog was kept in heel in a duck blind for the dogs safety and the dog was only released to do the job that the dog was quivering in eagerness to do only long after the bird fell. Its a stereotype to think that hunters treat their dogs only as tools to be dominated and abused. Just as in every activity, there are people who treat their animals poorly, but the hunters I know treat their dogs as family and mourn deeply the hunting dogs they lose. I’ve seen more eulogies and elaborate funerals for hunting dogs than I’ve seen for non hunting dogs. Even now I agonize over how to handle the upcoming hunting season with one dog in the prime of his life, one dog young and eager to begin, and one dog beginning to suffer the affects of age. My whole season will be tailored around giving her the gift of another joyful season even if it means skipping favorite spots, cutting the day short, holding back the younger dogs. Hunting is my gift to her, not her service to me. The difficulty in training a dog positively is that you are tailoring innate behaviors and instincts with your training. The activity is self rewarding for the dog. Consistency is important for the dog’s safety and steadiness is difficult to achieve when breaking the stay/whoa has a payout to the dog far greater than anything the handler could offer. A pro handler of hunting dogs will never have the relationship with the dog that an owner/dog team will have if the owner takes the time and energy and knowledge to invest, so the only tool the pro has is the e collar. Its a difficult balance. Teach the dog with the knowledge of a pro or teach the dog banking on the relationship between the owner and the dog when the owner doesn’t have the skill or knowledge to train. I think that is what retrieverman was getting at. The sport of retriever field trials has developed in concert with the use of the e-collar and the force fetch techniques. And, retriever field trials have little to do with actual hunting, rather like obedience trials have little to do with having a well behaved dog. I would like to try field work with my golden, but I would only do it if I can use only positive techniques. Here in Michigan we have Adele Yunck, who is working on a Master Hunter title with her Flat Coat. She teaches competition obedience using primarily positive techniques and has written the booklet “Positively Fetching.” One day, after we are finished with agility, Selli and I will work in field stuff with Adele. Using my very unscientific gut, it seems to me that the prevalence of negative techniques in dog sports coorelates with the length of time the dog sport has been in existence. For example, Water Work Trials for Portuguese Water Dogs is a relatively young dog sport. It requires many of the same skills as gun dogs do. Yet, all of the training seminars I’ve been to are positive and typically encourage clickers. Not only are blind retrieves required, but reverse retrieves as well. That’s where you send your dog out with a buoy in it’s mouth away from you 75′ in the direction the judge requests. Then you have to command the dog to drop or ‘set’ the buoy and return back to you…without picking up the buoy on the way back. Sending a dog away from you in a straight line in water is hard enough, but then asking the dog to drop the item out there on command and not pick it back up on the return…well it defies all PWD instinct..although it is a very practical fishing boat skill. But every water trial trainer I know teaches it with positive techniques. I wonder if the competitive water work sport was created 50+ years ago when hunting dog sport was, rather just 20 years or so ago, if I would also be expected to train my PWD with force. You can order Lorie Jolly’s book from her website http://www.Rosehillretrievers.com. Also, Barb Matthies is in the Madison area and trains positively and is very good. Her e-mail is Barb Mattheis [bgmk9nuts@hughes.net]. She does field trials with her goldens and is very successful. She is a positive trainer. OK. Just because I came arcoss this post I will let you in on something that I have in the works. I will be hosting a positive hunting dog training seminar in May, 2010. It will be in the Twin Cities area in Minnesota. I am working on the details but it will be a weekend seminar for beg. gun dogs. I cannot give anymore details just yet. Please contact Mike Stewart at WildRose Kennels in Mississippi. I have a dog from there and his training methods are the most gentle I’ve seen in the hunting genre. He also breeds and trains dogs for Diabetic Alerting, so he is fairly well rounded. He does not use shock methods or force fetch. Choke collars are used but rarely. I’ve worked with him in person and visited the kennel without warning and none of the dogs were even wearing collars at all!! I have been associated with a dog training club for two years. We have a large number of amatuer trainers guided by one semi-professional. We are constantly reminded that an e-collar IS NOT a training device as most of the above bloggers seem to think. Train and drill the four basics, sit, come, heel, and down. The e-collar is never used until the dog is rock solid and understands these commands. At this time, if the dog fails to obey a known command, an e-collar is used for correction only. I have witnessed a dog run over by a milk truck while chasing a pheasant because the dog chose not to obey a known command. This dog was trained with only positive re-enforcement and obeyed over 95% of the time. After the heartbreak and five years of morning, my friend finally got another dog and decided to collar condition the dog to sit on command. The new dog sits 100% of the time under all conditions. Does anyone know of a gun dog trainer who uses positive training methods in Northern Califoria? E-mail willowcreekkennels@hotmail.com They breed German Shorthairs and train pointing breeds. Met them at the Pheasants Forever show put on in Madison a while back. Hope this helps – our Vizsla puppy is doing very well with only positive training. It looks like it has been a while since a post on this subject! I too am soon getting a German Shorthair and want to train her for upland game without use of a shock collar. I am in Portland, Oregon and would like to know if anyone here is aware of a trainer using positive methods only. Or, if not a trainer, perhaps someone in NAVHDA in this area that has had success with positive (only) training. I was led to this blog and topic too by helping a friend to find a positive dog trainer in Midwest and train her GS Pointer. Sad to hear Steve Rafe was off in Midwest for long time now but I’m sure there will be more trainers in Midwest now. Thanks for the tips here anyway..
Hello, all. After two years of research and experimentation, FetchMasters, LLC, in Denver, Colorado, has launched the Positive Gun Dog Training Program. We offer board-and-train services and in-home training. Just wanted to add one newer resource. Tom Aaron of Fetchmasters, founder of the Positive Gun Dog Association, is another good resource now. (He was training his own dogs in 2009 when Trisha first wrote this post, but hadn’t started the association yet.) Membership in the association is free as of this writing, and they have discussion forums and a quarterly newsletter, the R+ Gun Dog. Like the positive herding trainers, almost all these folks use mostly R+ with a little mild R- of the “time out” variety. They don’t use P+. Perfection bird dog training is very successful at applying positive methods in the gun dog and has proven success with first place wins in akc field trails – check it out, you will not be disappointed! Hello folks! 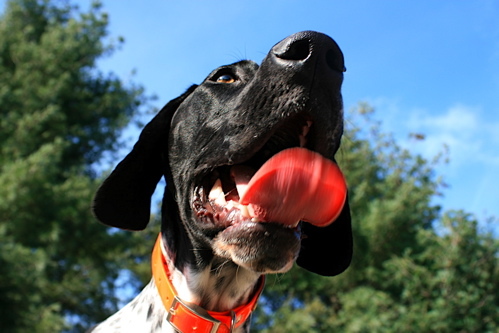 Have you ever consider preparing your dogs to hunt truffles? I heard its a thing now. Ive seen it on some article here in https://www.trufflemagic.com/blog/magic-truffle-hunting/ that they educate their pooches to chase and I think its truly cool. Any musings about it?